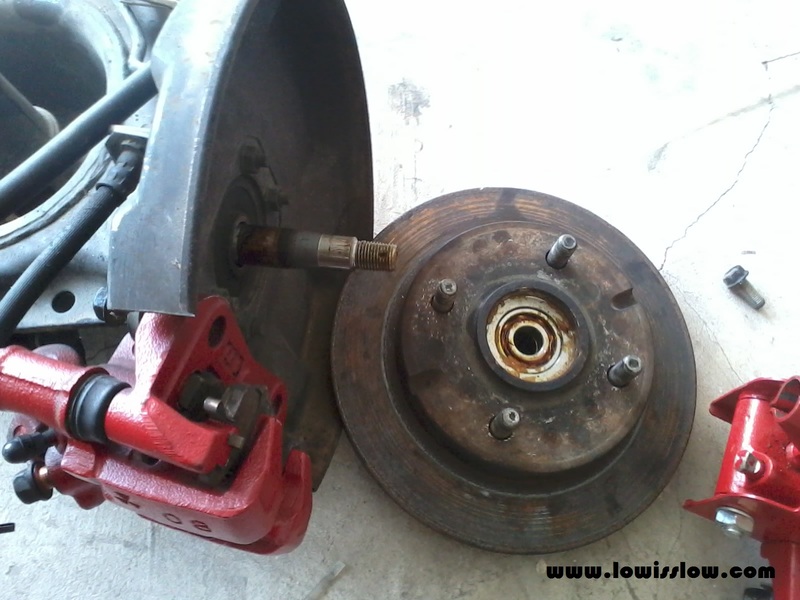 Hi all.. Now I want to show you on how to convert your rear drum brake into disc brake. For your information, rear disc brake for Perodua Kancil taken out from Daihatsu Mira L5. It is simple, easy to say that just plug and play. Of cause you need full set of tools, jack, and most of all, your energy. 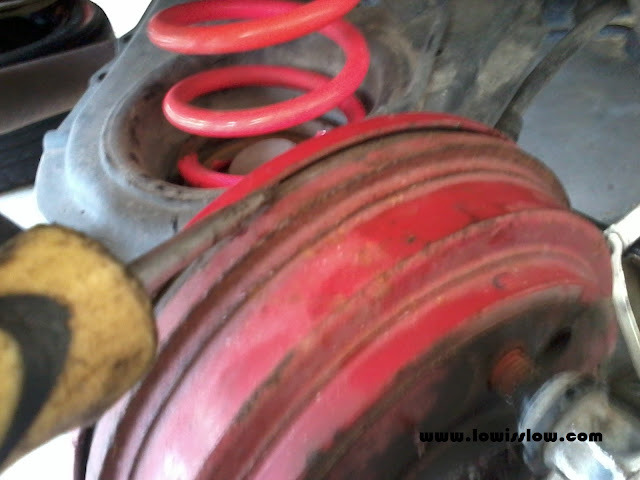 First step, remove rear tire and you will need a jack to do this. Remove the center cap and you will see nut inside the brake hub. Picture 2: Take out safety pin first! 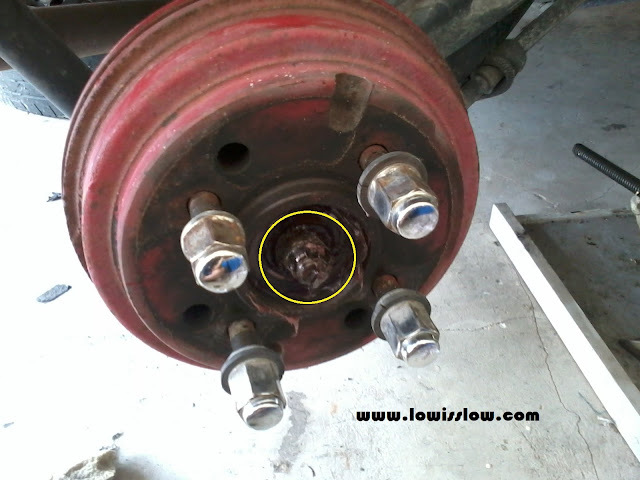 Picture 4: In order to take out the brake shoe, you must use your own creativity to remove all the spring hooks as in the circle. 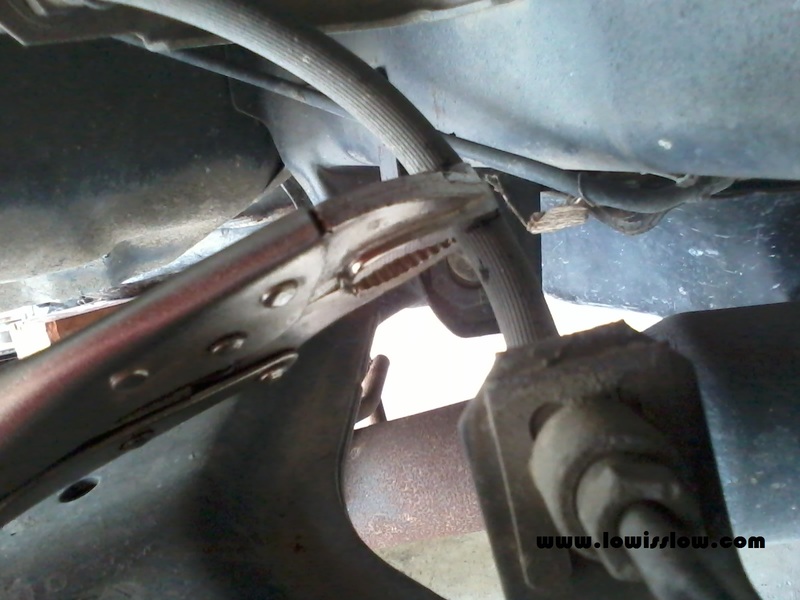 Picture 5: For this one, you can use pliers. just twist it (item in circle) left or right. 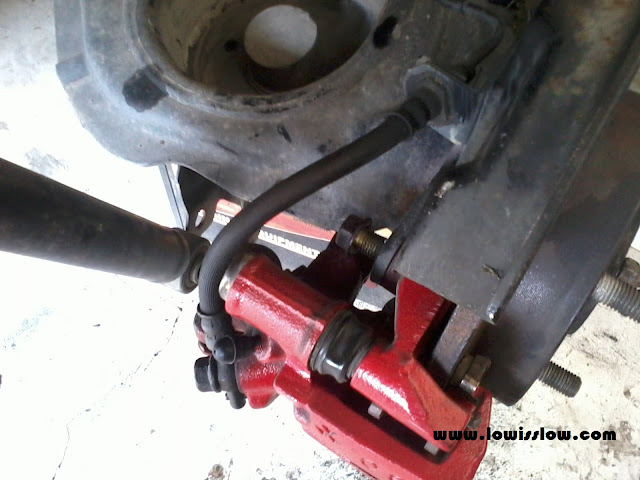 Picture 6: Clamp the brake hose to avoid the brake liquid reserve tank drained. Picture 8: Disconnect the brake liquid line. If you think the coil spring make your work harder, take it (coil spring) out by removing the lower bolt and nut of the shock absorber. 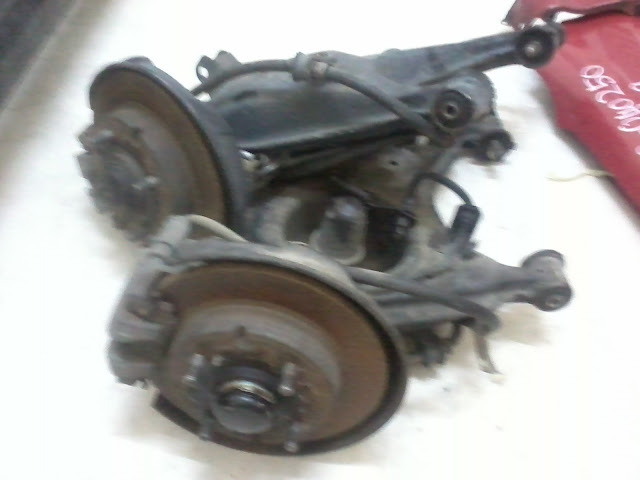 Picture 10: Mira L5 rear disc brake taken off from Mira L5 halfcut from Japan. Can be found at the used autopart shop. Picture 11: Disassemble the parts from Mira L5 rear disc easier than Kancil's drum brake. Picture 12: Before that, remove nut behind the center cap by using wrench no.17 (refer Picture No.1). 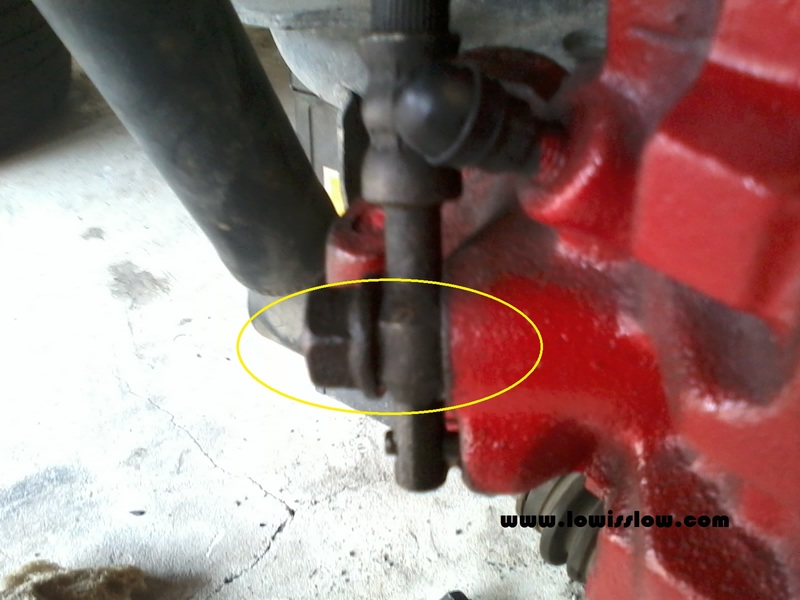 Then, remove upper and lower bolts of the brake caliper as shown at the picture above. 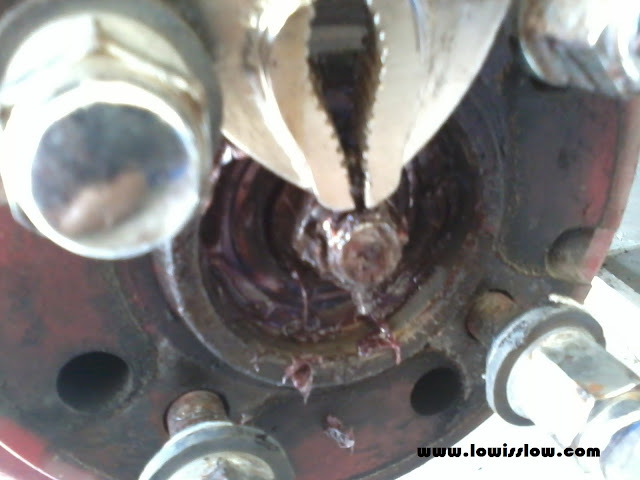 Picture 13: Disconnect brake liquid hos from the caliper. 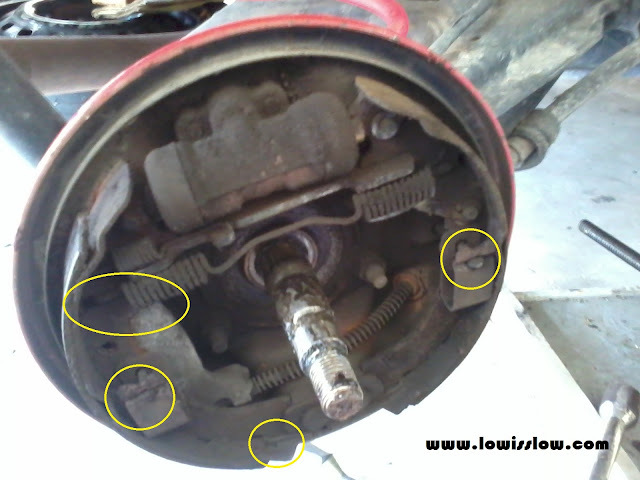 Now you can remove the caliper and the brake disc and then you will find 4 nuts as Picture no.7. Do the same thing! 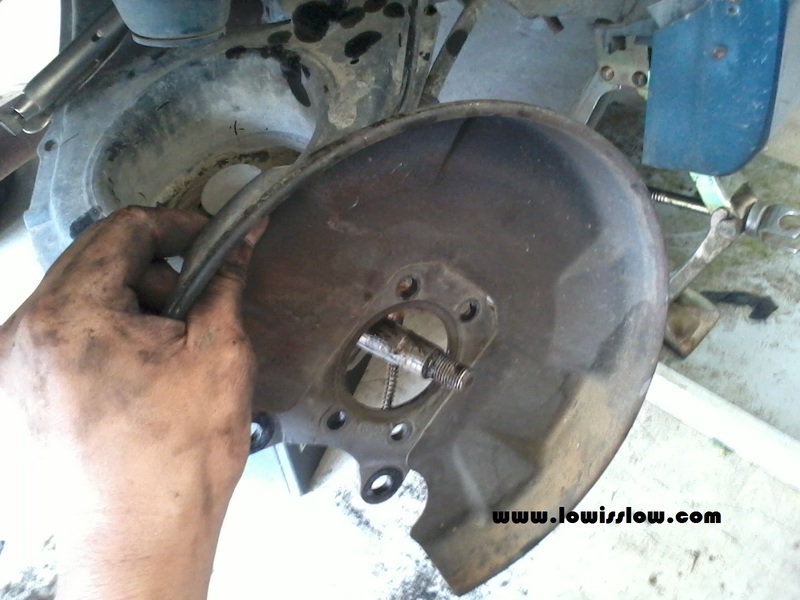 Picture 14: What you take off from L5 rear disc brake, just plug and play it to the Kancil's rear arm. Picture 15: Make sure it tight enough. Insert brake disc/rotor first and then the caliper. 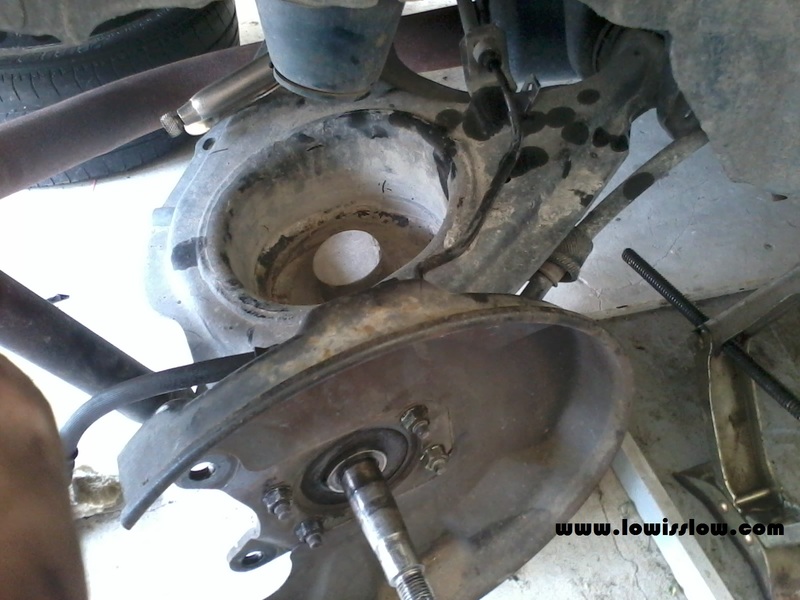 Note: Actually, you can just plug n play the whole arm of Mira L5 rear disc brake to the Kancil rear arm position. 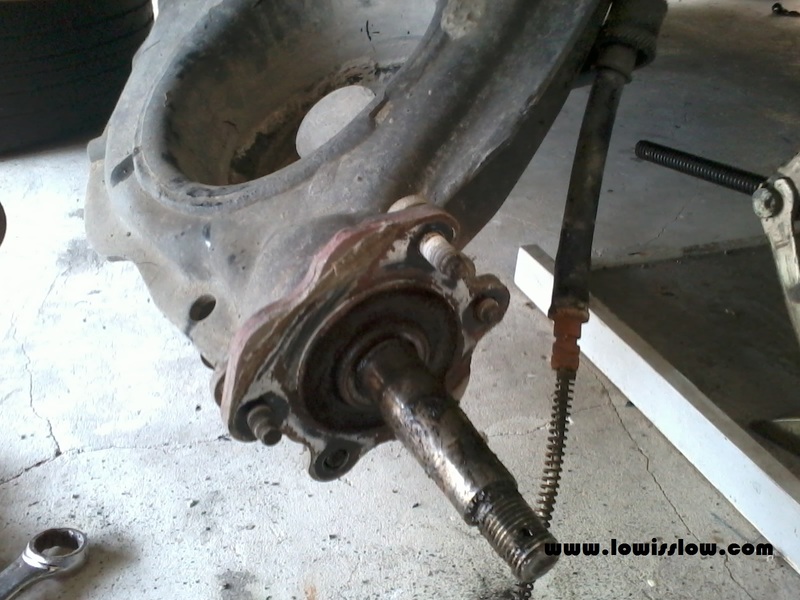 Just take out the whole kancil' rear arm and replace it with Mira L5 rear disc. But it will consume more energy and it is easy if you can lift up your car higher. 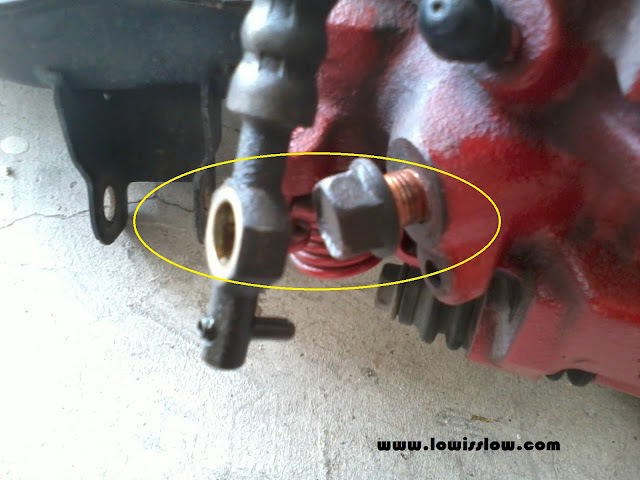 Now, you must do brake fluid bleeding at both side. You can do it yourself even no one with you. 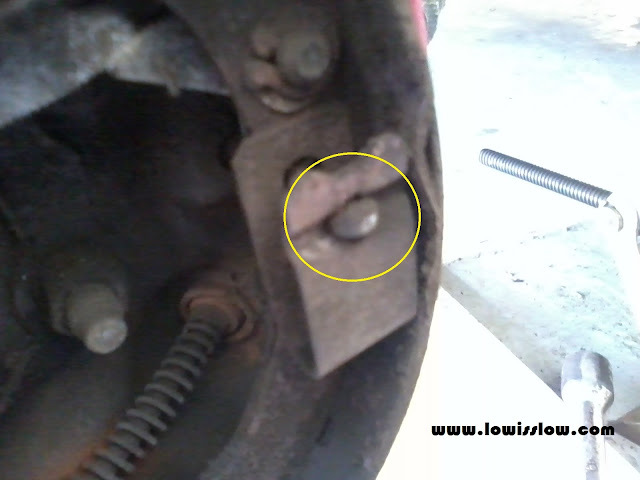 Click this link on Youtube.com on How to bleed brakes using "one person" method. Or you can use two person method if you got someone with you. 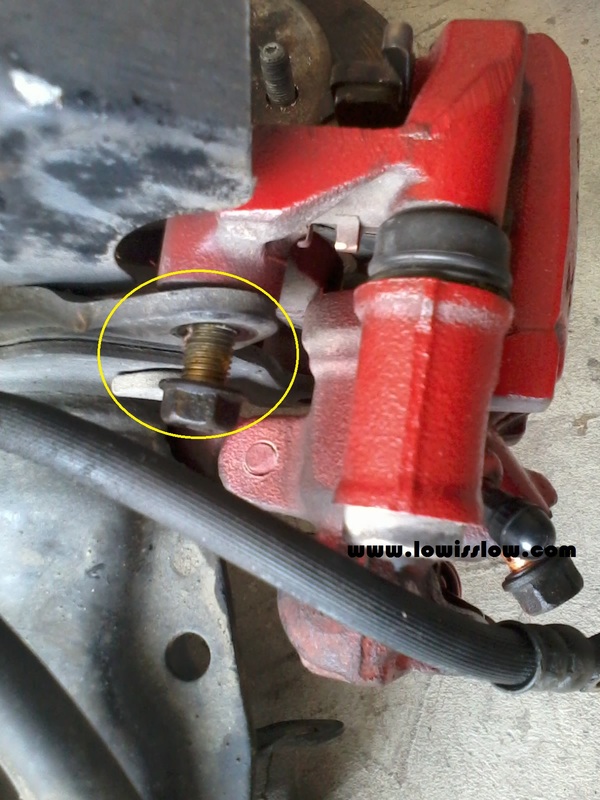 Refer to this Youtube.com video on How to bleed brakes. 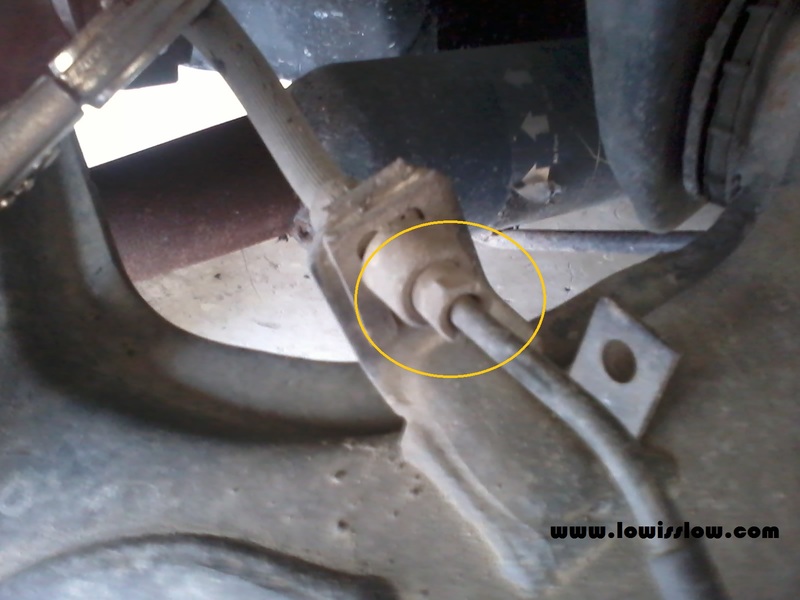 After bleeding process, go to the nearest workshop to replace stock handbrake cable to the L5 disc brake cable. 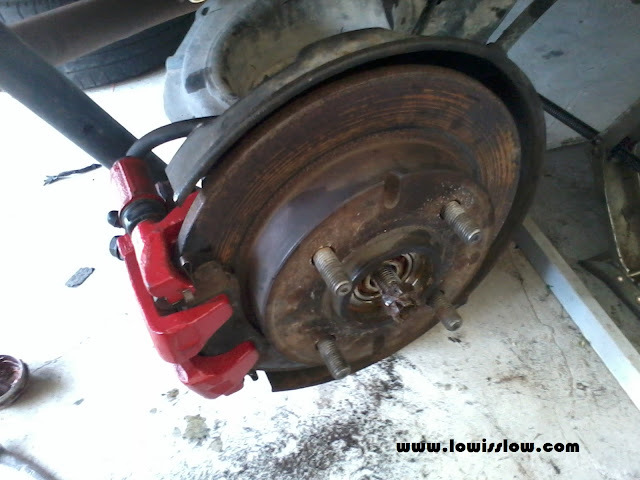 If you can get access to your car's undercarriage, you also can do it by yourself. Make sure safety come first. Now you can show off to your friends about your rare rear disc brake. so..where are the hand brake cable???? Wow, such a detailed and useful tutorial! I will keep this in mind just case, you never know what might come in handy. Thank you! Thanks for this instruction. I'm working on mine but unluckily, my caliper set come with so many rust and I'm doing a restoration on it. 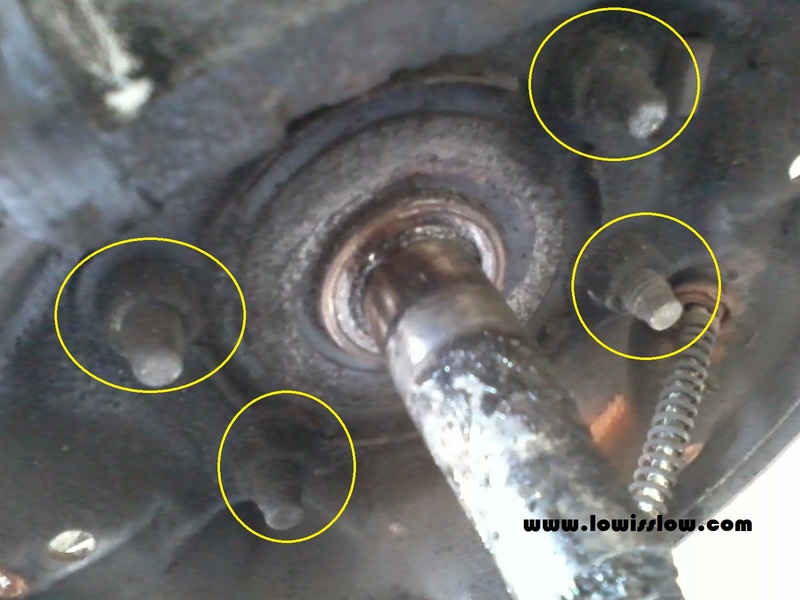 Unluckily the second time that lots of parts need replacing part and I can't find one on the internet. Please if you can help me find one pair of them parts. I really need those and also internet only as I live outside MY myself.